WEDNESDAY, Nov. 21, 2018 (HealthDay News) -- There are a number of ways you can serve up a healthier Thanksgiving meal, a nutrition expert says. "Cut back on boxed and premade processed foods by making more dishes from scratch," said Mindy Athas. She is an outpatient dietitian nutritionist at Carroll Hospital in Westminster, Md. Good choices for fresh seasonal ingredients include pumpkin, sweet potatoes, yams, leafy greens, tomatoes, green beans, Brussels sprouts and carrots, she noted. "Serve a rainbow using fall colors such as orange, red, yellow and brown by adding baby tomatoes, bell or sweet peppers, and chopped almonds, dates or figs," Athas suggested in a LifeBridge Health news release. Carroll Hospital is part of the LifeBridge health system. Salads made with fresh or fermented veggies, fresh or dried fruits, nuts, seeds and herbs. Soups made with vegetables, beans, pumpkin, or squash that can be served in mini gourds. Skewers or kebobs, with or without protein like chicken or fish. Use bright colors and consider grilled items like mushrooms, pineapple and peaches. Platters of sliced fruits and vegetables garnished with nuts, fresh herbs and lemon juice. Dips such as hummus, guacamole, black bean dip and tzatziki, a Greek cucumber yogurt dip. Use whole grain or multigrain crackers instead of white flour crackers, and substitute regular or Greek yogurt for sour cream, zucchini noodles or spaghetti squash for pasta, and riced cauliflower for white rice. Reduce the amount of salt by using fresh herbs, dried herbs and spices, as well as vinegars and spicy sauces. 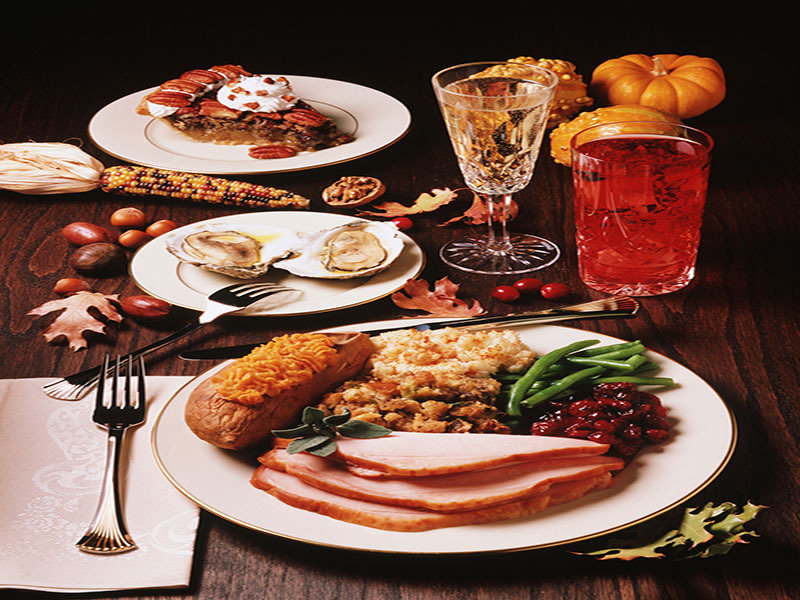 Consider other sources of protein besides turkey, such as seafood or lean cuts of meat. "Lean protein as well as fibrous plant food helps control intake of fatty, greasy items," Athas explained.